Unrivaled craftsmanship and unparalleled benefits - our portable partitions and room dividers will help you create space anywhere easily. Our portable partitions are a versatile solution for spaces of all sizes and shapes. We offer a variety of products that open, collapse, and store in a matter of minutes. The Room Divider 360 is a portable wall that quickly folds on its 360-degree hinges and can be rolled into a corner or closet. The StraightWall Sliding Room Divider is an adjustable wall that slides out just as easily as it slides back together. 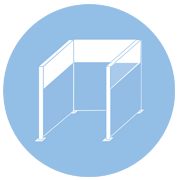 Adjust this portable partition from a single panel to a length of up to 15'6'' and divide your classroom, workspace, or training area with ease. Looking to revamp your open office? Forget old-fashioned accordion doors and cubicles. Try the Operable Wall, available in Folding and Sliding varieties, to create a conference room. 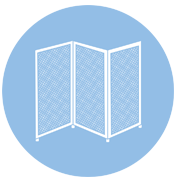 The wall-mounted, floor-based partition can cover spaces of up to 12' high and 19'2'' long, with an option to connect two via opposing walls. For break areas or more peaceful work stations, the Hush Screen portable wall is just the ticket. The 2'' thick acoustical panel keeps the peace, while its semitransparent window allows light to flow within the office. If it's an interesting configuration you want, the VersiPanel will exceed your needs. A floor-to-ceiling portable wall, the VersiPanel can serve as a wall between classes within larger rooms. With acoustical ribbed fabric and a heavy foam core, VersiPanel dampens sound. And its construction of multiple small panels makes it flexible enough to create an S, C, or L shape. For an affordable option, the MP10 is a canvas version of the Room Divider 360. Quickly create activity and study areas, with bright colors to keep your students alert. Need to divide a restaurant? Want privacy for your spray tan clientele? Or is crowd control your end goal? The Room Divider 360 does all of that and more. To provide a private area for large dining parties during special occasions, the acoustical fabric version of the portable panel is your go-to. For spray tan salons, the polycarbonate plastic version makes cleaning a cinch. Polycarbonate makes crowd control and foot traffic guidance easier as well, with a translucent quality that allows for visibility and passage of light. 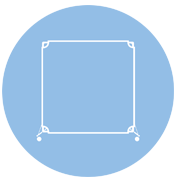 Whether you're displaying works in a gallery, museum, lobby, or classroom, we offer solutions to help you divide space and keep art secure. 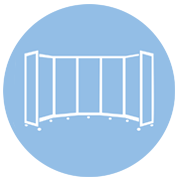 The Quick-Wall (Folding) is a no-nonsense portable accordion partition with optional wheels. With a sturdy aluminum panel and tackable acoustic fabric in neutral or bright options, this portable wall makes for the perfect display. To add a little whimsy to your classroom or children's museum without losing sturdiness, try the VersiPanel Jr. which is fully tackable, allowing it to double as a colorful art wall.